Watch a brief video animation on the basics of Keypoint. Shop for Bundles, Hardware & Software. The software plugs right into Microsoft® PowerPoint® to provide seamless integration with your presentation visuals. Our 5-button and 12-button keypads use patented wireless technology to ensure reliable and secure communications with the included USB transceiver. to measure learning, gather opinions and increase audience participation. 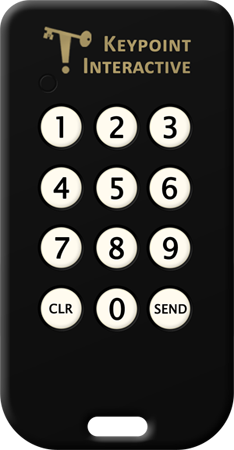 by using keypads anonymously and asking tough questions on controversial topics. by introducing a team competition based on your training materials. Completely Integrated with PowerPoint. Slides created with Keypoint Interactive use slide masters and templates like any other slide. Looking to replace an outdated system? Ask about our trade-in program!